Lots of bikes are being stolen around Seattle these days as the weather gets better. We’ve been seeing numerous posts on our Pinehurst Seattle Facebook page about stolen and abandoned bikes. 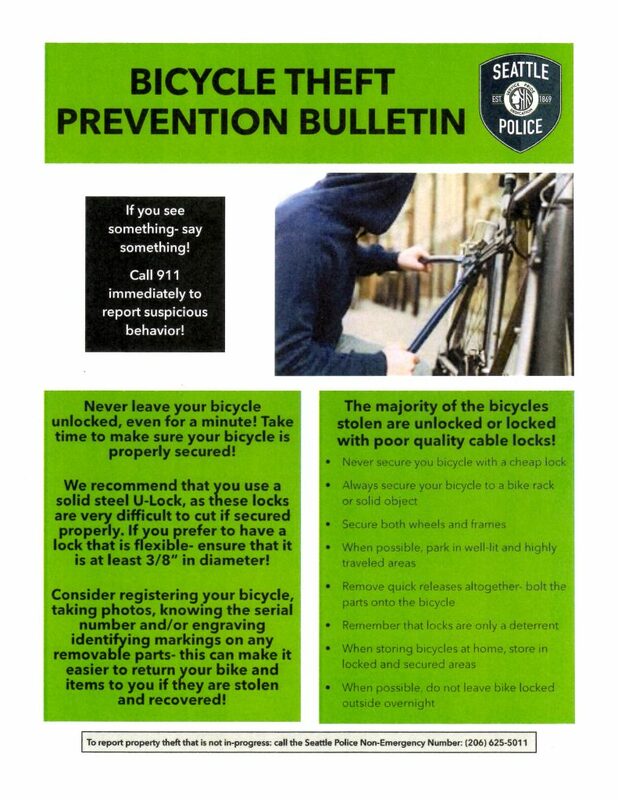 At this month’s North Precinct Advisory Council, the Community Police Team passed out a bicycle theft prevention bulletin. See below. The sergeant mentioned that there is a national registry where you can add your bike’s serial number to a database. It’s at https://bikeindex.org/. If police pick up a stolen bike, chances of getting it back to the owner are greater if the owner reported it missing and provided the serial number. Giving SPD a photo of the bike helps, too. Good reminders. Thank you. Also appreciatethe sites to post and look foryour missing bike.